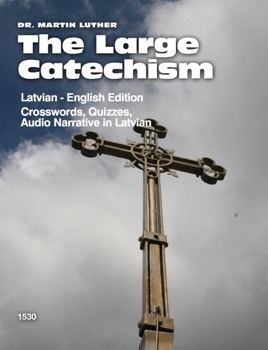 The book has been prepared as an adjunct teaching aid for confirmation activities for the Latvian Evangelical Lutheran church.It has been divided in chapters, with each one supporting each other: paralleling catechism texts in Latvian and English languages. Along each page in Latvian, a paragraph has been recorded, which corresponds to the written text. It is followed by chapters with crossword puzzles and exercises in Latvian and English languages. The goal of this book is to aid in better understanding Dr.Martin Luther's Large Catechism for those who have found a home for a short or longer time period away from Latvia and are growing in their faith in Jesus Christ.Just as it will help them maintain their ability to communicate in Latvian while reading and listening the texts in Latvian and English.